Deepings Swimming Club will start the 2018/2019 season with a new club kit and a new chairman after long-serving Martyn Reynolds retired from the committee. He has been replaced as chairman by Steve Tappern who steps up from vice-chairman. It’s the end of an era at Deepings as Martyn has been an integral part of the club since 1990 when his daughter and son started swimming lessons. From helping out on poolside during galas, he became club coach for the junior squads and was appointed chairman 13 years ago. 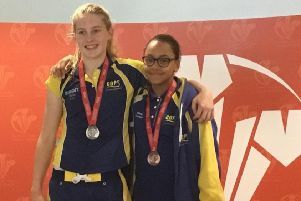 During that time, Martyn has overseen one of the most successful periods in the club’s history, with multiple swimmers winning honours at national championships and representing Great Britain on the international stage. One of his proudest moments was being elected president of Lincolnshire ASA in 2016. While no longer on the committee, Martyn has been voted in by members as the club’s new president and will continue to run the Masters and Junior Masters swimming sessions. “I would like to say a huge thank you to the numerous people who have both mentored and helped me over my years at the club and I am looking forward to my time as club president,” Martyn said. New chairman Steve Tappern has already made his mark on the club after overseeing the introduction of a new kit for swimmers and coaches earlier this year. 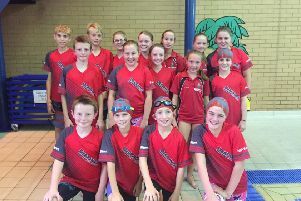 The swimmers’ t-shirts take the club’s traditional red and add a modern twist with black indents (colours reversed for the coaches’ tops), while the caps are now charcoal grey, embossed with the red Deepings logo. Steve described becoming chairman as “an immense honour” and thanked Martyn for his contribution to the club over many years. Steve has pledged to continue the good work of his predecessors, helping swimmers to meet their aspirations and building on the club’s recent successes. Deepings Swimming Club trains at the Deepings Leisure Centre with squads to suit all ages and abilities.